Dimensions 2.50 by 7 by 9.75 in. Amazon.com description: Product Description: Now in force in over 80 countries, the Convention on the International Sale of Goods (CISG) is one of the most successful and wide-reaching attempts to unify legal instruments for international commerce. The CISG's range of influence in international practice has significantly expanded, potentially governing more than 80% of world trade. In addition to the growing case law, the volume of case law reporting and scholarly writing on the Convention and its provisions and problems has increased dramatically. The Convention also continues to influence legislators on the international as well as the domestic level. 6iCommentary on the United Nations (UN) Convention on the International Sale of Goods (CISG). Since the publication of the first edition in 1998, the book has become an invaluable source for the comprehension and discussion of the Convention, frequently cited by legal writers, tribunals, and courts all over the world. Thoroughly revised to reflect the growth and complexity of case law relating to the Convention, the book also considers new developments in the field of the CISG, particularly the accession of Brazil to the Convention. It also assesses all relevant scholarly writing on the CISG since 2009, with a special emphasis on the opinions issued by the CISG Advisory Council that are being considered as persuasive authority by courts and tribunals across the globe. Written by an international team of contributors, this book provides comparative expert analysis, and combines judicial and scholarly views from numerous jurisdictions. 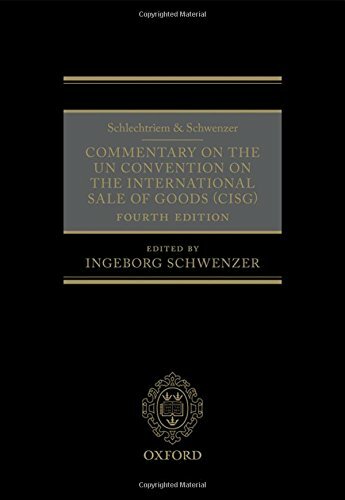 This is the most comprehensive and authoritative commentary on the CISG, and an invaluable resource for scholars and practitioners alike. About: Now in force in over 80 countries, the Convention on the International Sale of Goods (CISG) is one of the most successful and wide-reaching attempts to unify legal instruments for international commerce.